Savory Oatmeal with Black Pepper, Blue Cheese, and an Olive Oil Fried Egg: Combine 1/3 c. oats (for one serving; multiply amounts to serve more) in 1 c. water with a big pinch of salt. Bring to a boil then lower heat and simmer 5 mins, stirring often. Meanwhile, fry an egg in olive oil: crack an egg into a pan of hot olive oil, sprinkle with salt and pepper, and cook over medium-low heat until the white is set and the yolk is cooked to your liking. When the oats are cooked, scoop them into a bowl and stir in lots of black pepper and a few crumbles of blue cheese, plus additional salt to taste. Top with the fried egg, more black pepper, a few more crumbles of blue cheese, and a handful of sliced green onion. p.s. And by “people” up there at the top, ok, I mean “people who can vote in the U.S. election.” If you are one of my Bulgarian readers—I love having Bulgarian readers!—or hail from elsewhere in the world, you are excused from voting responsibilities today. But I hope you will still enjoy this breakfast. I feel like this was made for me. Four of my favorite things in the whole world–savory oatmeal, blue cheese, a creamy egg yolk, and ludicrous amounts of black pepper? Sign me up. Happily, I have blue cheese in the fridge so I know what I’m making for breakfast this morning! I already know I’ll love this combination. Thank you for sharing! Emmy, this looks fabulous and so enticing! Brilliant flavor combinations and I love the originality. Sounds like it would also be a satisfying, quick dinner for those tired-must-eat-now nights. I haven’t yet tried olive oil to fry eggs but now I will. P.S. Early voting by mail is the way to go! We were just talking about savory oatmeal dishes. Will have to give this a try. Don’t worry about the voting, though … a cup of coffee was all I needed to dash out to the polls! I love this, Emmy! Olive oil fried eggs are the best! Yay for eggs and oatmeal! I have never actually put my egg on top of my oatmeal and eaten them together, though. (Actually, I usually eat eggs and oatmeal at totally different meals…) Sounds great! I like this idea. I don’t eat grains often, but If I did, it would be for breakfast with fresh eggs from my little flock of free rangers. Your love affair with savory oatmeal is still tempting me! HOLY bazingas. THIS is the kind of dish that makes being a weekday vegan a great choice. Thank you SO much for sharing. We’ve found it really liberating. And in truth we usually eat the same way for MOST of the weekend, but knowing we can diverge takes the pressure off and eases cravings. And allows us to eat things like this. Oh my galoshes! I just made this for breakfast and it was SO GOOD. 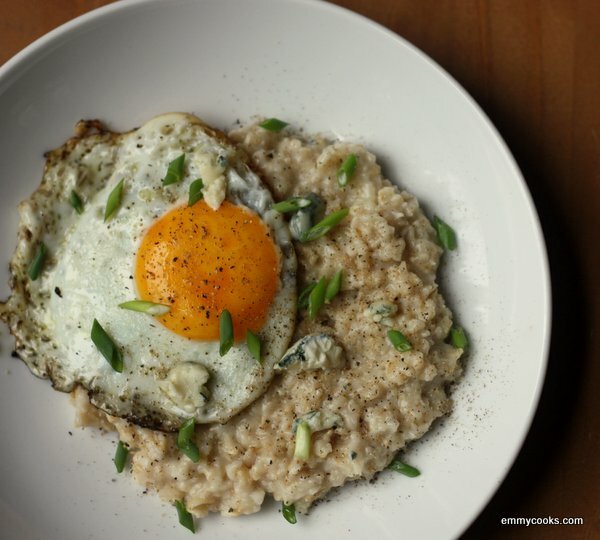 The blue cheese makes the oatmeal super creamy, and I love anything with a fried egg on top of it. Frying it in olive oil adds another layer of flavor. Can’t wait to see your next savory oatmeal dish. BTW, I was thinking that a savory oatmeal bar could be a cool brunch idea. Cheers!